A passenger goes through the TSA security line at McAllen International Airport on Thursday Oct. 19, 2017, in McAllen. TSA is implementing new, stronger screening procedures for carry-on items that require travelers to place all electronics larger than a cell phone in bins for X-ray screening in standard lanes. New TSA rule for screening electronics will apply at all U.S. airports. 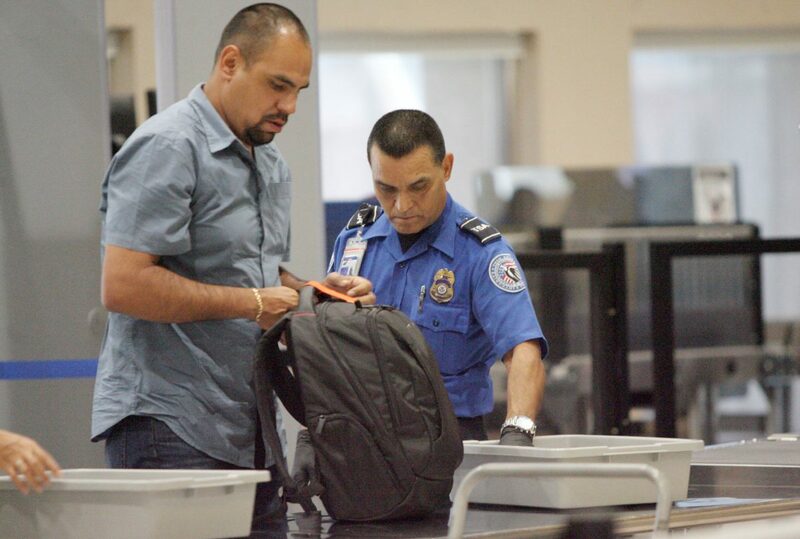 McALLEN — Travelers will have to place electronics larger than a cellphone into a bin to be X-Rayed when going through security at McAllen-Miller International Airport beginning in November. 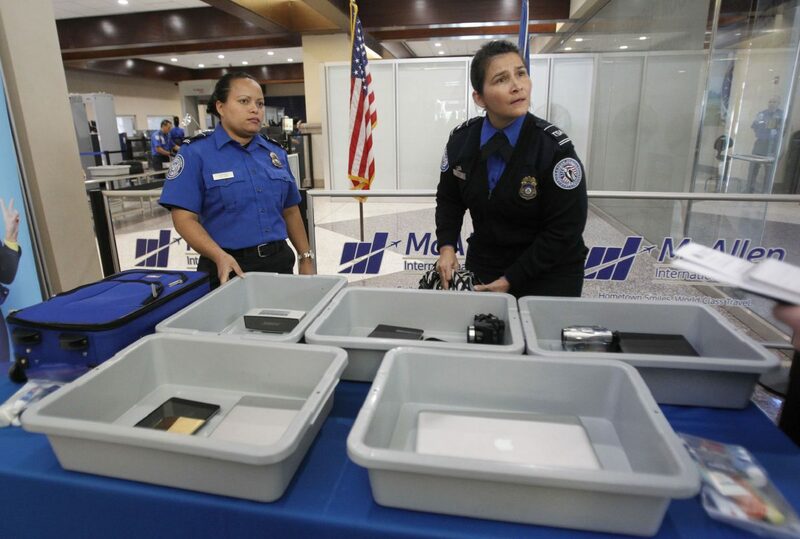 Tablets, portable speakers and other electronics qualify in the Transportation Security Administration’s new screening process that will begin at Valley International Airport in Harlingen on Friday before McAllen’s roll out in November. The new procedures began earlier this month at Brownsville-South Padre International Airport. 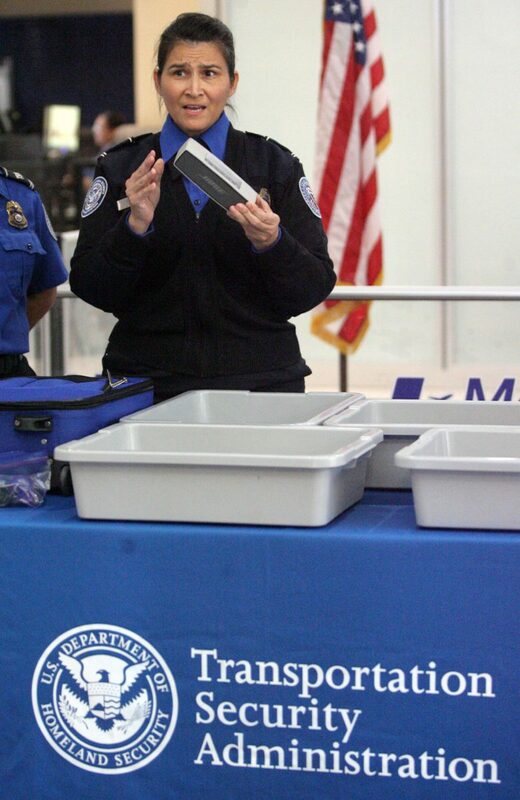 Those electronic items were not previously required to be placed in bins at TSA checkpoints. There are no changes to what travelers can bring through the checkpoint. TSA’s website, www.tsa.gov, has a search function to inform travelers what they can and cannot bring. At a news conference at McAllen’s airport Thursday, TSA Regional Public Affairs Manager Carrie Harmon encouraged travelers to ask TSA questions on the government agency’s Facebook and Twitter pages. Johanna Almanza, TSA lead officer, left, and Anna De Leon, a TSA specialist training instructor, demonstrate the new TSA procedures for passengers with electronics at McAllen-Miller International Airport on Thursday Oct.19, 2017, in McAllen. Anna De Leon, a TSA specialist training instructor, removes items from luggage during a demonstration of the new TSA rules for passengers at McAllen Miller International Airport Thursday Oct.19, 2017, in McAllen. “You can take a picture of an item you’re unsure about, tweet it at us, and we will directly tell you whether that specific item is allowed,” Harmon said. The reason for the increased screening is due to further intelligence gathering by the Department of Homeland Security that indicates terrorists seeking to use electronics as means to impose harm, Harmon said. The heightened security measures should not increase security line wait times, Harmon said. These stronger measures do not apply to passengers enrolled in TSA pre-check. In June, DHS announced new security procedures for nearly 280 airports in more than 100 countries.